Rich, creamy pies and some low-sugar fruit varieties (e.g. blueberry and strawberry rhubarb) make the perfect low-carb dessert. But what about the crust? Wouldn’t ingredient restrictions make creating a tender and flaky crust dang near impossible? Well, actually, no. Not only is it possible, but it’s easier than you think. Whether you need a pre-baked crust or a fill-and-bake one, there’s a gluten-free, low-carb option that’ll fit your needs and skill level. Below are three tried and tested crusts that’ll work for a variety of pie recipes. The coconut-flour rolled crust can be used for single or double crust pies, both sweet and savory. The no-roll almond flour crust is a no-fuss, shortbread-style crust that can be used for practically any recipe calling for a single crust. And, finally, the no-bake chocolate crust is perfect for refrigerator-set pies with fillings that pair well with a chocolate shell. In a large bowl, mix 2 cups almond flour and ¼ teaspoon of salt until well combined, then add ¼ cup granular sweetener, 2 tablespoons melted butter, and 1 egg. Mix with hands until it forms a ball. 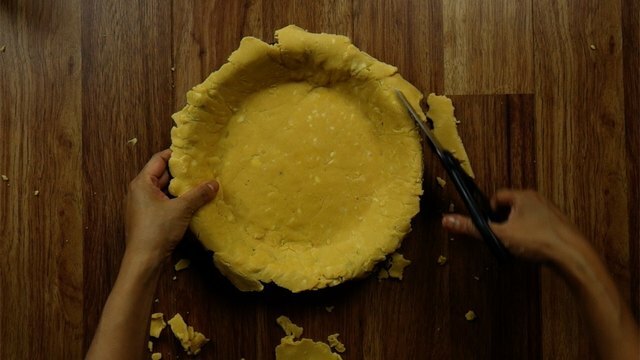 Place ball of dough into a 9-inch pie plate and press down evenly to form a crust. 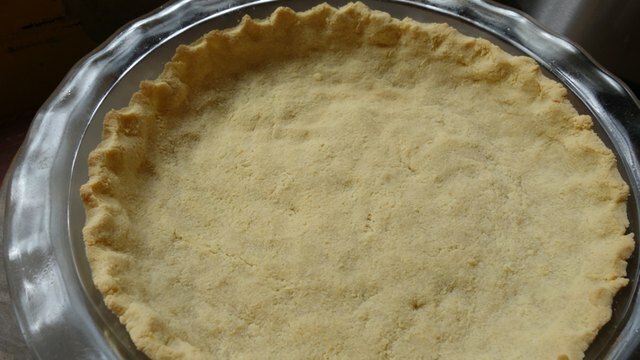 If you need a pre-baked crust for a no-bake pie (such as French silk) bake at 350 degrees Fahrenheit for 10 to 12 minutes or until golden and firm. If you’re making a baked pie (such as pumpkin), prebake the crust at 350 degrees Fahrenheit for 8 minutes with the edges covered in foil before filling and baking. This ensures that the bottom of the crust is fully baked without the edges getting burnt from too much heat exposure. This recipe comes from Sugar Free Mom and it produces a tender, flaky crust resembling a traditional pie crust. 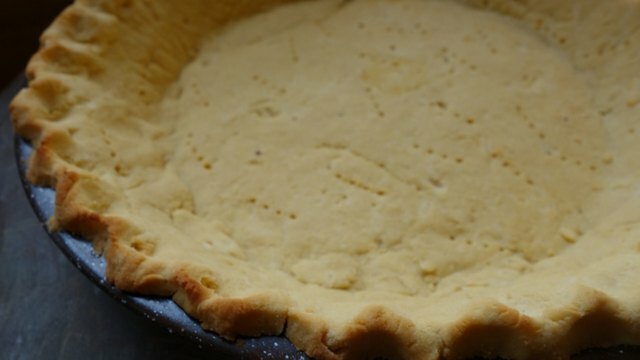 In fact, the method is similar to the standard shortcrust pastry method, save for the addition of an egg and the substitution of coconut flour (in a lesser amount) for wheat flour. The optional addition of vanilla helps to mask the coconut flavor if you don’t want any trace of it in your pie. 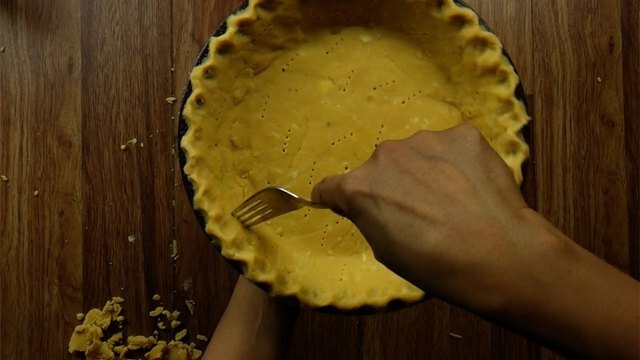 In a medium mixing bowl, combine 1 egg, ¼ cup granular sweetener (omit if making a savory pie), and 1 teaspoon vanilla (optional for sweet pies, omit if using for a savory pie). Mix until well combined, then set aside. In a food processor or large mixing bowl, combine 1 cup coconut flour and ¼ teaspoon salt. Mix or whisk to combine. 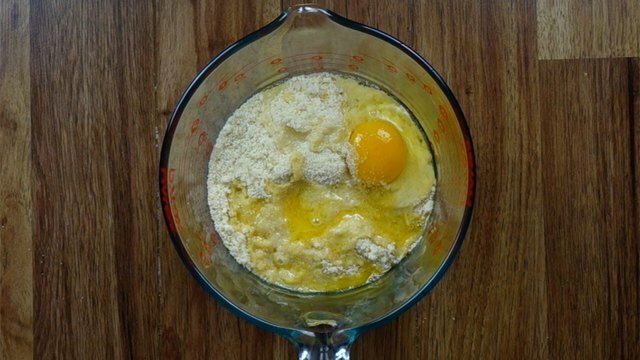 Then, pour in pre-combined egg mixture. Add ½ cup cold, cubed butter to the food processor or bowl. 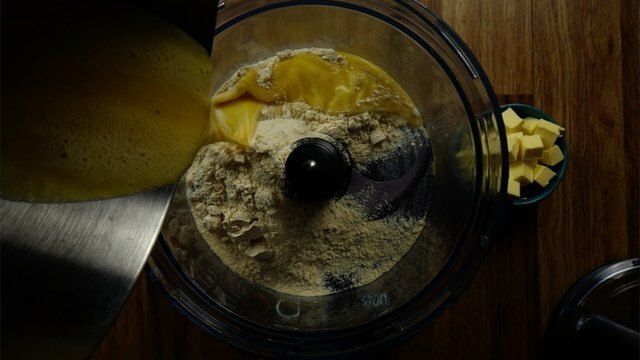 If using a food processor, pulse about 4 or 5 times (only for 1 second each time), until the mixture just comes together. Note that there should be small, visible pieces of cold butter in the dough. 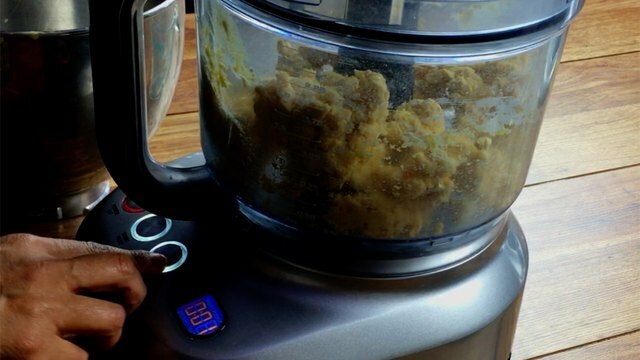 If not using a food processor, use a fork to first combine the egg mixture into the dry ingredients, then a pastry cutter to cut the cold butter cubes in. 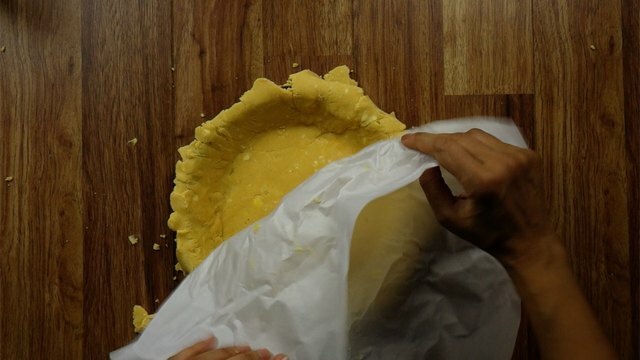 Roll out the crust between two sheets of parchment paper until about ⅛ of an inch thick. 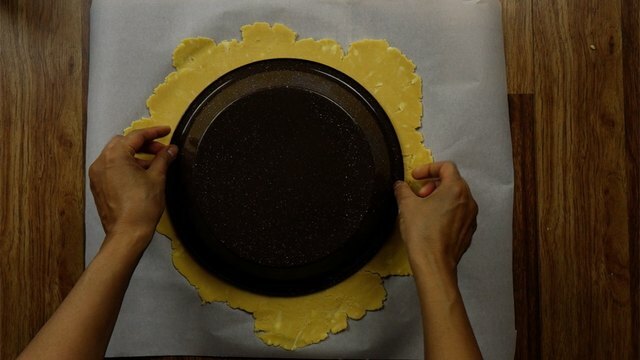 Peel off the top layer of parchment and place an inverted 9-inch pie plate on top of the crust. Flip the parchment paper, crust, and plate over, then peel off the paper. Gently ease the crust into the pan and trim excess crust from the edges. Try not to handle the dough more than needed to avoid melting the butter. Also, the dough has no elasticity so will tear if stretched. Patch up holes or tears with the excess pieces that were trimmed off. Flute the edges, then prick all over with a fork to allow heat to escape while baking. 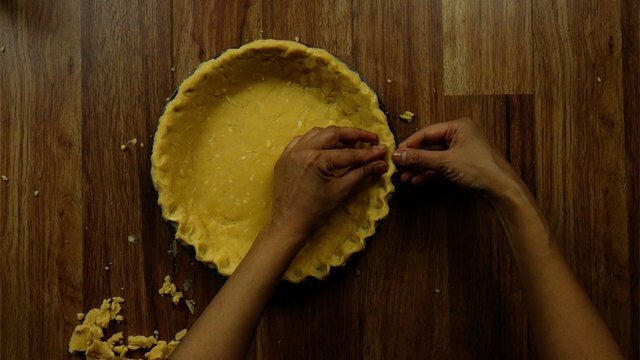 For a pre-baked pie crust, bake at 400 degrees Fahrenheit for 10 to 12 minutes. If you’re making a baked pie (pumpkin, etc), partly prebake the crust at 400 degrees Fahrenheit for 8 to 10 minutes with the edges covered in foil before filling and baking. This ensures that the bottom of the crust is fully baked without the edges getting burnt from too much heat exposure. 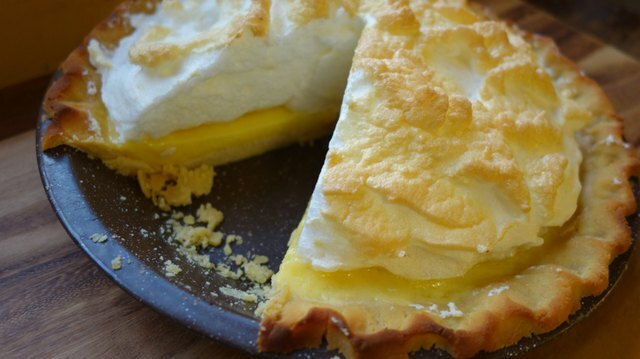 I paired this crust with low carb lemon meringue pie with terrific results. 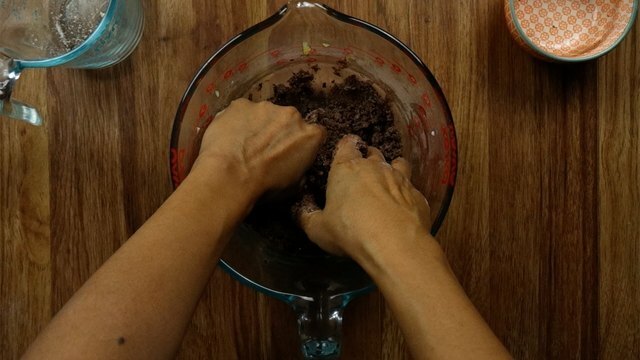 In a large bowl, mix the almond flour, butter, cocoa powder, sweetener, and salt until moist and crumbly. It's easiest to use your hands. 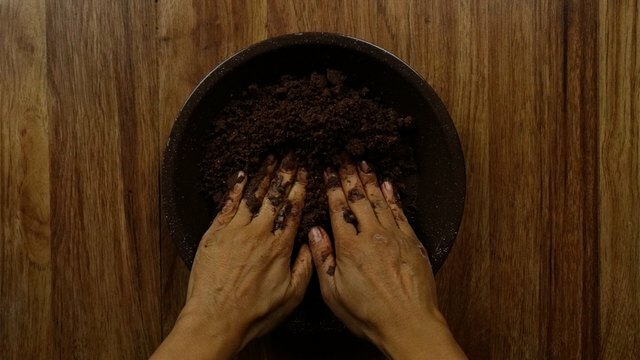 Put the `crumbly mixture into a 9-inch pie pan and press into the pan evenly to form a crust about ⅛ of an inch thick. Chill your crust in the fridge while you make your no-bake filling. The crust will continue to set after it is filled and further chilled. This no-fuss crust is featured in our recipe for no-bake peanut butter cream cheese pie, pictured below. 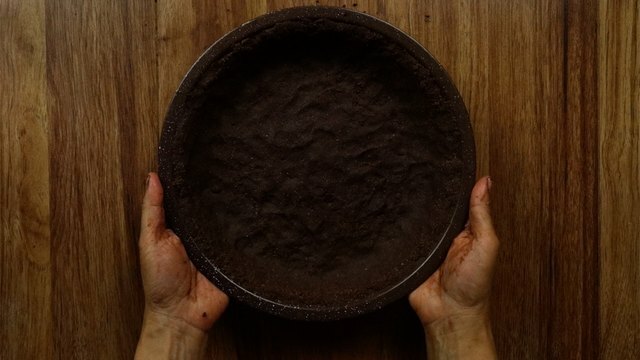 Or for a double dose of chocolate, try using this crust with a French silk pie or no-bake chocolate cheesecake.